Sitting down at a keyboard and writing, rambling on, can be an odd preoccupation. You end up having a conversation with the inside of your skull. An imaginary person is sitting there, and you're talking away. It is possible to be entertaining, instructional, and engaging. It is even possible to do all of that all at once. It is possible to annoy, anger, and enrage. I've done that as well. In fact I've had someone once, thankfully just once, threaten me. I laughed it off. Being "On The Net" since the dusty old days of when dinosaurs roamed the Earth and the years started with 19, I have watched things go from being an academic discussion to the current obsession with cats, selfies, selfies with cats, and butts. Thanks to some pseudo-celebrities, it's even Selfies with Cats and with Butts. We're doomed I tell you, Doooomed! This audience is always imagined, and sometimes it shows its head. Mostly polite of course. Most people are, or at least try to be, or at least think they are. I've been at this for quite a while, and probably will continue for a while. After all, it's easy to take a picture. It's even easier to write about what you were thinking about. I tend to do that and keep a few pictures in abeyance - that's in my back pocket. Bang out a few paragraphs and so forth. But you really never know what will get people excited. I've found that the recipes and the dog postings are very popular. There are, however, some days you just don't understand. This business with statistics. You go into your favorite blogging platform and you can find out what people were looking at. You also can do that with Google Analytics. Both of which I do on a daily basis. But I think I had a statistical anomaly that I am still scratching my head about. No don't run away. It's not going to be banging on about how wonderful it is, or how it's the perfect thing to do with your old computer that got replaced on Xmas or Chanukah or your birthday. It is, but that's not the point. While I do talk about Linux from time to time, I don't do it frequently enough to become an authority about the subject. I'm kind of "middle of the road" with my knowledge on the subject. Level 2 support, maybe Level 3, if you're taking notes. When you look at your statistics and see that you got so many hits from so many places, you have to scratch your head. Yeah that again. I got 75 percent of my readers in yesterday from people sitting on a Linux computer. 3 out of 4 readers yesterday agreed that Linux was the platform of choice. As opposed to about 1.5 percent of them in the real world. Fifty times more people hit this blog with a Linux computer than in the real world? Is my math correct? Penguins unite! You have nothing to lose but your Microsoft shackles! Cross platform here. Platform agnostic. Dry, I'll stop that before I confuse you. I just ... don't... get... it. 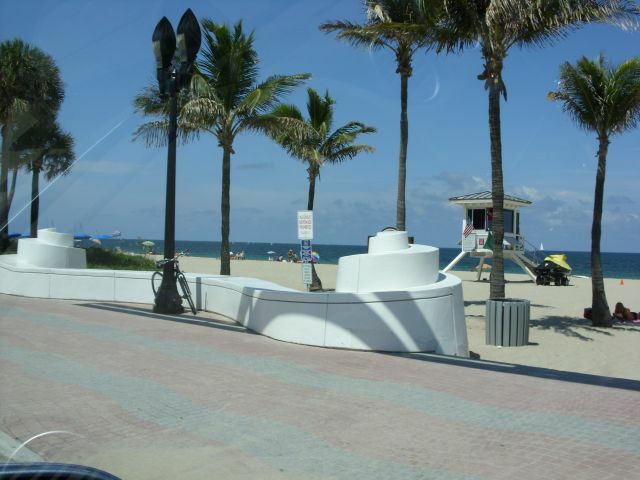 So instead I will just post a picture of the beach at Fort Lauderdale and call it even. After all, my own family is suffering through some below 0 F wind chills today. It won't even hit 70 here today or as we say "It's not a beach day ... unless you're from Minnesota". But the Linux thing.... I just don't know! Reminds me that I need to find the chip reader. There's an i7 laptop that needs a copy of CentOS dropped on it for a server project I want to complete with Wordpress and a proper LAMP stack.